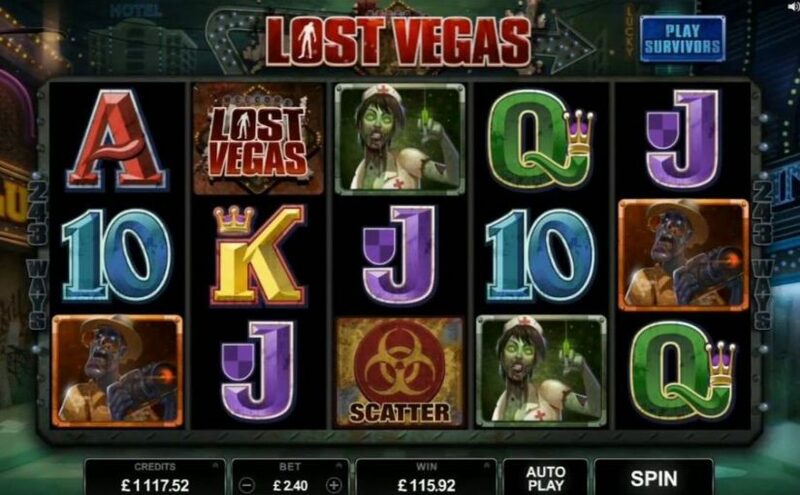 Lost Vegas is a 5 reel, 243 ways to win online slot powered by Microgaming. The moment you enter the game, the entity of it will strike you. The entire game is just stunning and incredibly fascinating. When starting the game you must choose a aide, zombies or survivors. The symbols are all made in outstanding animations with sound effects. The best part just might be that you can switch sides from zombies to survivor’s in-between any spin. The special symbols of this game depend on which side you have chosen since they both feature various bonuses, rewards, and features. There are two bonus features of Lost Vegas, one for the survivor mode, and one for the zombie mode. Blackout Bonus feature – the survivor bonus – can appear at any time after a losing spin. When this happens, a sudden blackout will occur, the screen becomes black for a few moments before the night vision goggles are put on. This bonus results in real high cash prizes! The Zombie fistful of cash – the zombie bonus – is also completely random and is triggered by a losing spin. When this happens, a gigantic zombie hand full of cash reaches up from below the reels. This one can also grant you some tremendous cash wins! If you get the losing spin, with a nuclear Scatter symbol somewhere on the reels, the free spins feature is triggered. The Scatter is the same for both game modes, but the survivors get the free spins with an additional Stack feature. This shows as an avalanche where the low valued symbols fall from the reels to be replaced by fresh symbols falling from above. But even better, all symbols that will disappear will add to the survivor stash meter that is placed above the reels. This is where the prizes are collected, and you will be awarded this after the feature ends. The free spins feature in the zombie mode is a bit different; the Zombie mode has an Infection feature. Here, the zombies turn into Wilds and will infect all reels they touch for the remaining of the free spins. This game mode has the potential of being the most rewarding of the game as it can grant you with up to 2155x the max spin with 45 in credits.